ITAC is responsible for trade remedies in South Africa. 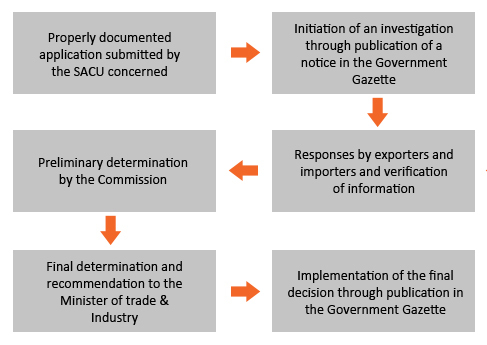 The Trade Remedies Unit of ITAC administers the trade remedies instruments through investigation of alleged dumping, subsidised imports and a surge of imports into the SACU, in accordance with domestic legislation and consistent with WTO Rules. Dumping, which is a form of international price discrimination, refers to the practice of a firm selling the same good at a lower price in an export market than in its domestic market. Dumping becomes an unfair business practice and actionable under domestic and international law when it causes or threatens to cause material injury to domestic manufacturers producing an identical or similar product to the dumped import. Material injury is measured in terms of declines in the prices, sales volume, profits, market share, employment and other factors of domestic manufacturers. There is therefore a necessary link between dumping and injury without which remedial action by national investigating authorities is not permissible. Anti-dumping actions are an exception to the World Trade Organisation (WTO) principles of binding tariffs and non-discrimination between trading partners (also know as the most-favoured nation principle). Anti-dumping actions are narrowly targeted at specific products from specific countries and, in those countries, at specific producers or exporters. The international rules governing the right of contracting parties to apply anti-dumping measures are contained in Article VI of the General Agreement on Tariffs and Trade 1994 (GATT 1994) and in the Agreement on Implementation of Article VI of the General Agreement on Tariffs and Trade 1994 (commonly referred to as the WTO Anti-Dumping Agreement). These Agreements and nearly 60 other agreements, annexes, decisions and understandings are the result of the 1986-1994 Uruguay Round of Multilateral Trade Negotiations which led to the establishment of the WTO on 1 January 1995. South Africa is one of the original signatories to the Agreement Establishing the WTO (WTO Agreement), which is the umbrella agreement of the WTO system. Parliament ratified the WTO Agreement in terms of section 231(2) of the Interim Constitution on 6 April 1995. The WTO Agreement, including GATT 1994 and the WTO Anti-Dumping Agreement, thereby became binding on South Africa under international law. Although binding on South Africa under international law, GATT 1994 and the WTO Anti-Dumping Agreement do not form part of the domestic laws of South Africa. This results from the fact that GATT 1994 and the WTO Anti-Dumping Agreement were never enacted into South African law by national legislation, and section 231(4) of the Constitution provides that an international agreement becomes law in the Republic only “when it is enacted into law by national legislation”. Consequently, these agreements do not vest rights or impose obligations enforceable under South African domestic law. Anti-dumping investigations conducted by the International Trade Administration Commission of South Africa (ITAC) are regulated by domestic legislation, namely the International Trade Administration Act, 2002 (Act No. 71 of 2002) (the ITA Act) and the anti-dumping regulations promulgated thereunder in 2003 (the Anti-dumping Regulations). This does not mean, however, that GATT 1994 and the WTO Anti-Dumping Agreement are irrelevant in anti-dumping investigations in South Africa. Rather, in light of section 233 of the Constitution, these agreements serve as an interpretative aide to domestic legislation. Anti-dumping duties are imposed as protection for a SACU industry against unfair trade, where foreign producers export products to SACU at prices lower than their domestic selling prices, causing or threatening to cause material injury to the SACU industry. The process to complete an anti-dumping investigation is on average 10 months from the date of initiation of an investigation. Countervailing duties are imposed to offset the injury to the SACU industry caused by subsidised imports. The procedure followed and the time taken to complete an investigation, are similar to that of an anti-dumping investigation. A review involves a re-examination of the level of dumping and/or material injury and/or the need for the continued imposition of anti-dumping or countervailing duties. More information on these different types of reviews can be obtained from the Trade Remedies Unit. Safeguards are short-term measures to remedy serious injury to a SACU industry caused by a sudden surge in imports as a result of unforeseen events. The ITA Act includes provisions dealing with the treatment of confidential information provided to the Commission. The Commission must ensure that confidential information is protected, but is also required to make available on request non-confidential information, including non-confidential summaries of confidential information, which is used in dumping, subsidy and safeguard investigations. Please note that if it is not possible to provide a non-confidential summary, a sworn statement, witnessed by a taker of oaths, such as a notary public or commissioner of oaths, is required setting out the reasons why it is impossible to comply. The Trade Remedies Unit operates a Public File system for all investigations. These files hold all non-confidential information relating to the investigation. These files are available for viewing or copying. The SACU industry can apply to ITAC for an Anti-Dumping, Countervailing or Safeguard investigation. The Minister of Trade and Industry has the sole authority to impose a duty or a measure upon receipt of a recommendation from ITAC. Questionnaires/application forms can be obtained under Trade Remedies - Application Forms, or directly from the Trade Remedies Unit. The contact details appear under the Contact Us.